Welcome Home Series handlesets are the perfect addition to your front door to create a unique and fashionable entryway to your home. Each is stylishly designed to provide maximum-security protection. There are many styles, finishes and configurations from which to choose. Heritages stylish arched shape accented by graceful beveled lines emanate exquisite sophistication. Single Cylinder Handle Set Phoenix's decorative accents will complement any home dicor to make a great first impression. The Antique Nickel finish offers a warm feel to the products style. Step up to designer styles and superior security with Weiser Metropolitan Boutique products. This privacy lever is best used in interior bed and bath applications where privacy is required. Levers are locked or unlocked by push button inside. The outside lever can be unlocked by an emergency key. Introducing Handleset Mix & Match by Weiser. The same Weiser simple and elegant style with the added benefit of chosing your own adventure. The curved and rectilinear lines of Hawthorne make a beautiful exterior complement to many design styles. The Venetian Bronze finish is hand-rubbed to reveal unique bronze highlights and provides a rich and warm complement to the product's style. 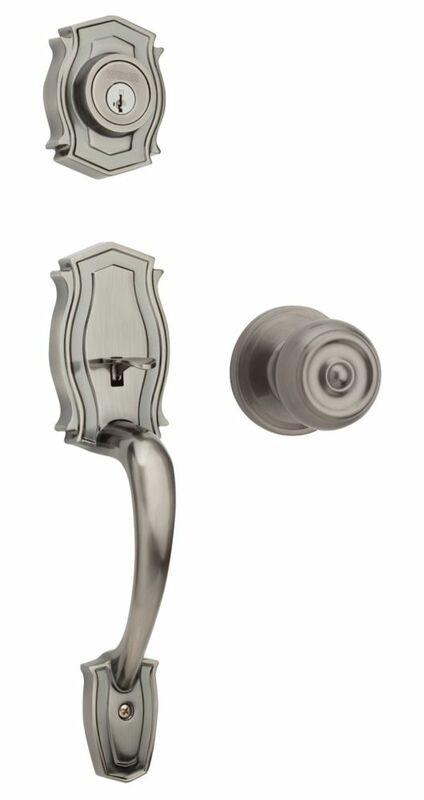 Heritage Single Cylinder Antique Nickel Handle Set with Phoenix Knob Welcome Home Series handlesets are the perfect addition to your front door to create a unique and fashionable entryway to your home. Each is stylishly designed to provide maximum-security protection. There are many styles, finishes and configurations from which to choose. Heritages stylish arched shape accented by graceful beveled lines emanate exquisite sophistication. Single Cylinder Handle Set Phoenix's decorative accents will complement any home dicor to make a great first impression. The Antique Nickel finish offers a warm feel to the products style.